While we stroll idly through the campground, swatting mosquitoes and trying to enjoy the last moments of daylight, we’re joined by reinforcements. A pair of fluttering wings begins zigging and zagging above our heads. Is it an owl? No; its flight pattern is too erratic. Even the most coordinated owl can’t manage such midair acrobatics. Our benefactor turns out to be a bat, a fierce predator of mosquitoes and other night-flying insects. Thanks, buddy; you can join our camping trip anytime. Although these flying bug hunters are often the subject of horrid childhood fantasies, they are a camper’s good friend. Bats won’t take a bite out of your hide and – campfire tales to the contrary – it would be extraordinary if one came close enough to become tangled in your hair. 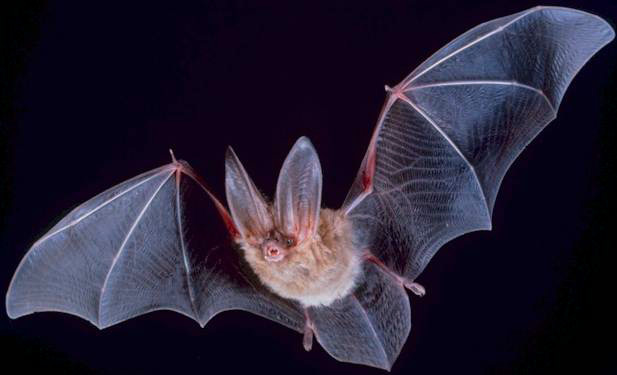 North American bat species are not only non-threatening; they’re also nocturnal. Some leave their roosts to begin the hunt at about the time we take that last walk; others sleep in until it’s fully dark. So silent is their flight that it’s unusual to see them at all. No doubt there have been many more flying benefactors around us than we could possibly know. Insects are their game, and since campgrounds are often located among trees and near water, bats can find plenty of food to sate their huge appetites at these spots. Since bats are the only mammal adapted for flight, you might expect them to have some pretty unusual body parts – and you’d be right. First, the obvious: they have no hands. The arm and hand bones are there, however; they’re just redesigned. From “elbow” to “wrist,” the bones are proportionally much longer than those of other mammals, as are those of the “hand.” Visualize dramatically elongated fingers, with a tiny hooked thumb protruding from the wing. The remaining fingers form the main flying structure of the wing. The double-layered membrane covering the “arm” stretches all the way to the back feet and (in most species) to the tail beyond, forming a continuous web, i.e. the wing. Some bats use the pouch of membrane that stretches from their hind leg to their tail and then to the other hind leg for scooping up flying insects. One quick grab, and it’s down the hatch. A bat’s back legs have their own strange adaptations. For example, the knees bend backward, more like our elbows, which makes walking problematic. That’s why you don’t find a bat going for a stroll or searching for ground insects. They’re either in flight or roosting upside down. Two of the more common bat species have the most charming names – the western and eastern pipistrel (the French word for bat). These tiny creatures venture out in early evening and enjoy the same habitats as campers. Their sudden turns and rapid flight are enough to make one dizzy. Bats are seldom spotted in great numbers. They’re rather solitary by nature; so, you’ll see one or, at most, a few individuals. There are notable exceptions, of course. Travelers who are fortunate enough to have viewed the nightly exodus of the Mexican freetail bat from Carlsbad Caverns know what we mean. A couple of decades ago, hundreds of thousands of them might have been seen. Today, loss of habitat and excess use of pesticides have dramatically reduced their numbers. But the nightly departure is still very impressive. One spring evening we watched the bats leave Carlsbad Caverns, and then we drove back to our campground in Carlsbad, New Mexico. As they were not tied to highway travel, the bats had beat us there and were already swooping over the nearby river in a feeding frenzy. The public can’t view the bat roosts at Carlsbad. They’re situated away from the public areas, and necessarily so. Should nursing mothers be disturbed, they may abandon their young, and there goes the next generation. Not all bat species roost in caves, of course, just as not all bats roost en masse. Old buildings, hollow trees, mine shafts, rocky crevices, and, of course, church belfries are common choices for those that roost alone or in small numbers. Should you spot bats at their roost, enjoy them from a distance. By using binoculars, you might see a female with nursing young. For the first few days after a bat is born, the mother carries it with her when she feeds, but it soon grows too large for efficient flight and is left behind at the roost. No matter how many bats share that roost, the mom knows instinctively which youngster is her own. Bats’ ability to use echolocation – a process of locating distant or invisible objects via sound waves – has been the topic of extensive research. After bats proved that in a totally darkened room they can fly with great speed through a network of closely spaced wires, scientists tried the same thing with silken threads that were so close together the bats had to draw in their wings to avoid contact. No problem. The bats “beeped” 200 times a second, using the returning echoes to discriminate wire and thread from the fruit flies also flying about the room. In spite of all that interference, they averaged two fruit flies every half- second and ate more than 200 flies in 15 minutes. Now you know why we just love sharing our campsites with bats. Y’all come . . . and eat hearty.